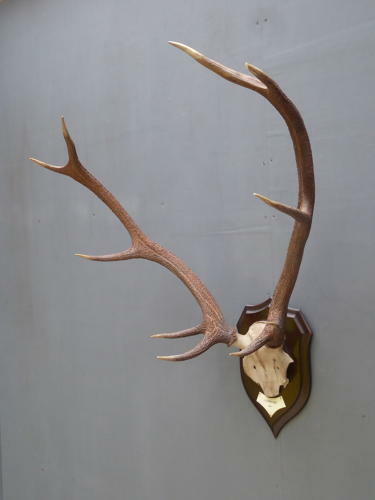 A fantastic set of vintage taxidermy deer antlers by the iconic Rowland Ward Ltd. Beautiful branching ten point Scottish red deer antlers with a wonderful texture & colour, mounted on a solid oak shield finished with an ivorine plaque. The plaque is engraved 'Drumrunie, 1953' & the rear of the shield is finished with its original paper label for Rowland Ward, Picadilly. Wear commensurate with age, very good original condition, clean & ready to hang.